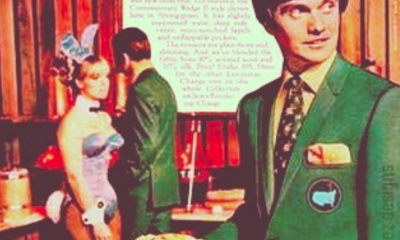 Golf simulators have come a long way from the Dave & Buster days of golf simulation. 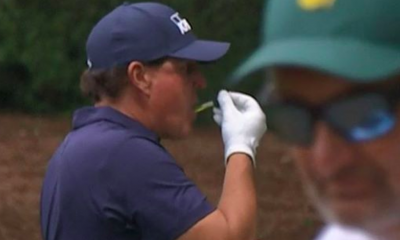 New technology has driven the golf simulation to new incredible heights. The new realistic simulators are allowing golfers to practice and play golf indoors when the weather will not cooperate. Golf simulators come in many forms and sizes. Models range from Wii Golf, which uses the Wii remote to replace the golf club and ball. On Wii Golf, players swing their arm to control a simulated golf club on the screen. The flight of the ball is displayed on either the user’s computer or TV screen. 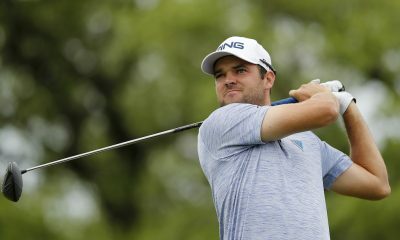 The most-advanced golf simulators use computer vision-based camera systems that use high-speed cameras to track both the club and the golf ball after the golfer hits a regular golf ball with their own clubs. 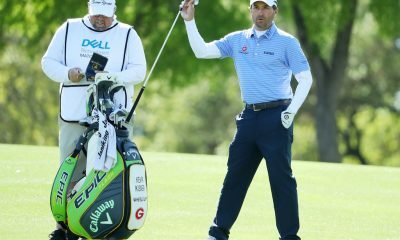 Other types will use a laser tracking system to track the ball and club. These systems generally use a projector to display the golf shot on a large screen displaying either a photorealistic or computer generated golf course image in front of the player. 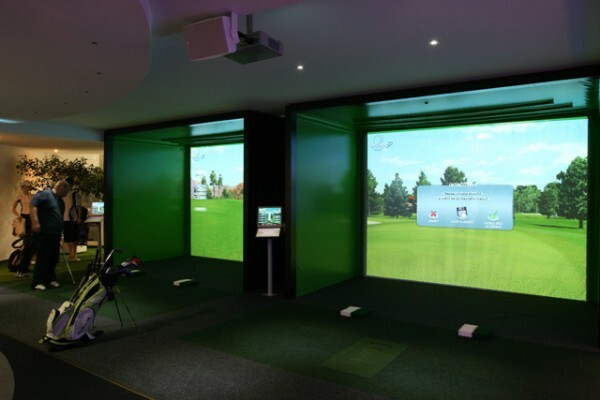 Golf simulators are installed in a wide rage of locations including private homes, business offices, golf retail stores and new type of business, indoor golf centers. 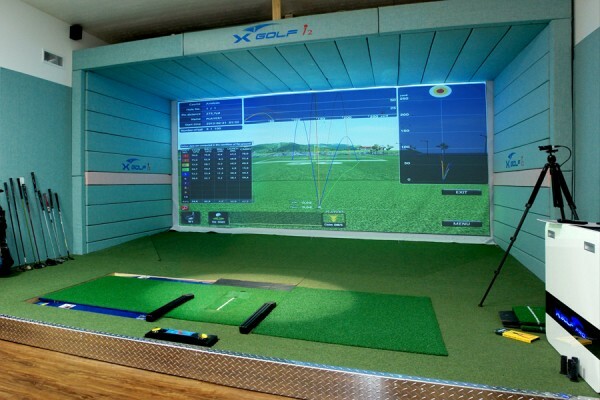 Indoor golf centers typically have two to 12 golf simulators installed and offer golfers a way to play golf when the weather makes playing outside impractical. Some simulator companies are including video capability and pressure plate technology for teaching purposes that indoor centers are offering. 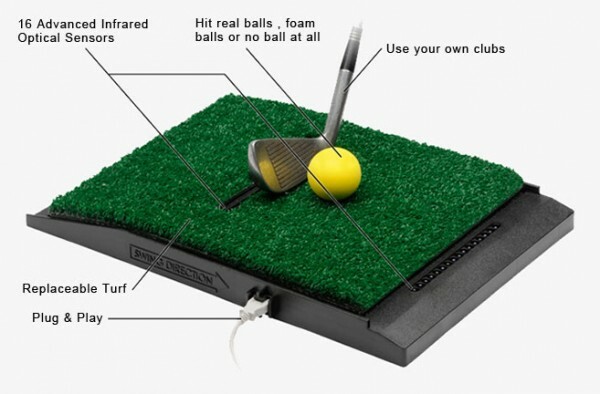 Some lower cost golf simulators use sensors contained in a golf hitting mat to monitor the club and ball contact zone and calculate the resulting golf shot. One of the most critical features for people considering installing a golf simulator is ceiling height. 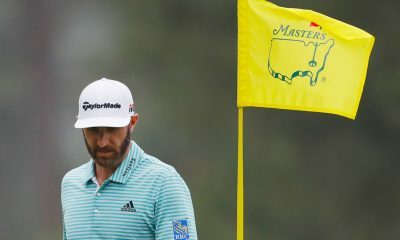 To be able to safely swing a golf club indoors requires a ceiling height of at least 10 feet, otherwise there is a real risk that some tall players might hit the roof with their golf club. 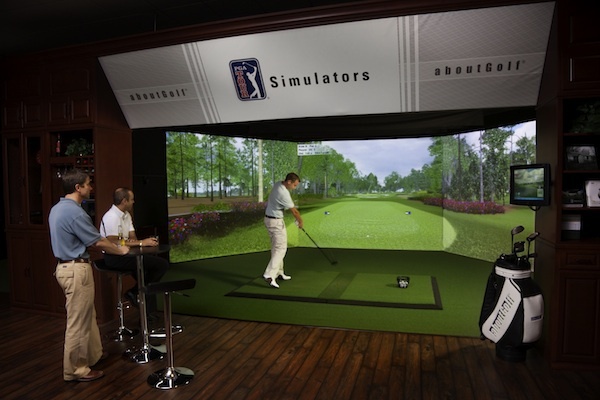 At the PGA Merchandise show last week, displays from most of the major golf simulator manufacturers were on hand to introduce their new innovations. aboutGolf uses its proprietary 3Trak ball tracking technology to track the ball and club. That 3D machine vision technology, known as 3Trak, was released in May 2008 and has since revolutionized the indoor golf experience. 3Trak begins gathering club data as the club approaches the ball, and begins gathering ball data at the moment of impact. High-speed, 3D cameras gather images of the ball and the club at up to 2300 frames per second. The images provide direct measurements on extensive data related to the ball and club, providing useful information for instruction and improvement. 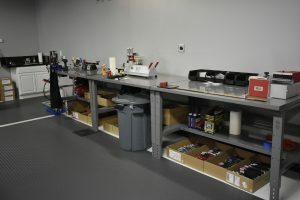 The measurements are also used in conjunction with true-trajectory physics to accurately replicate the shot — regardless of its speed, direction or shape. 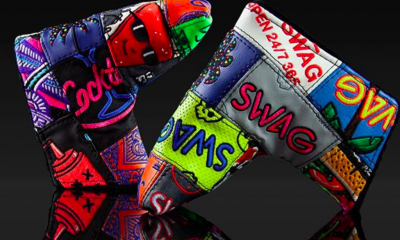 COST: aboutGolf simulators run from $39K to $90K, and 41 courses are available. For more than 25 years, Full Swing Golf has dedicated itself to delivering the most innovative, high-quality, realistic and enjoyable golfing experience available on an indoor system. 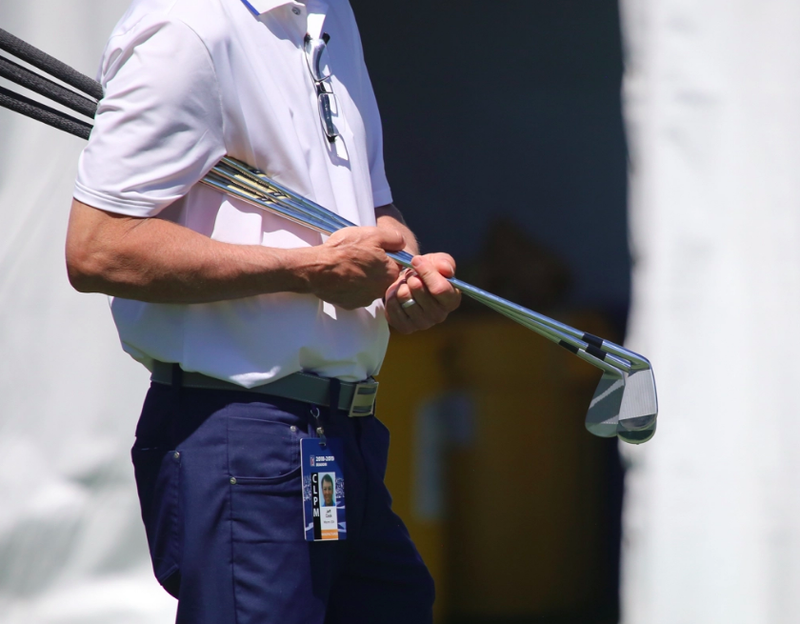 Some of the world’s most respected golf professionals also use Full Swing in their teaching and training regimens, such as Hank Haney, Ian Poulter, and Mark Wilson. COST: Full Swing simulators run from $45,000 to $65,000 and 80 courses available. Interactive Sports Technologies™ out of Vaughan, Ontario, Canada is the manufacturer of High Definition Golf™ simulators set a new standard in accuracy and realism for indoor golf. 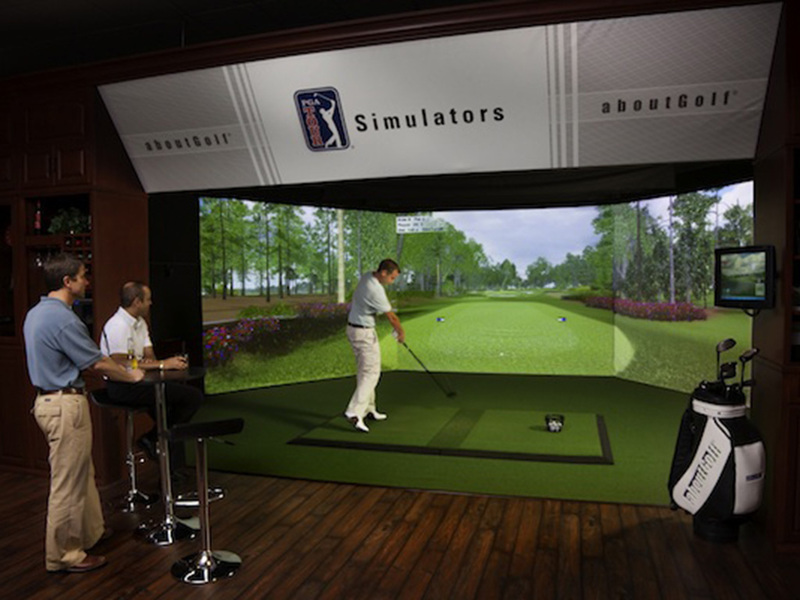 The simulator utilizes advanced computer vision technology to provide the most comprehensive and precise shot analysis in the simulator industry. 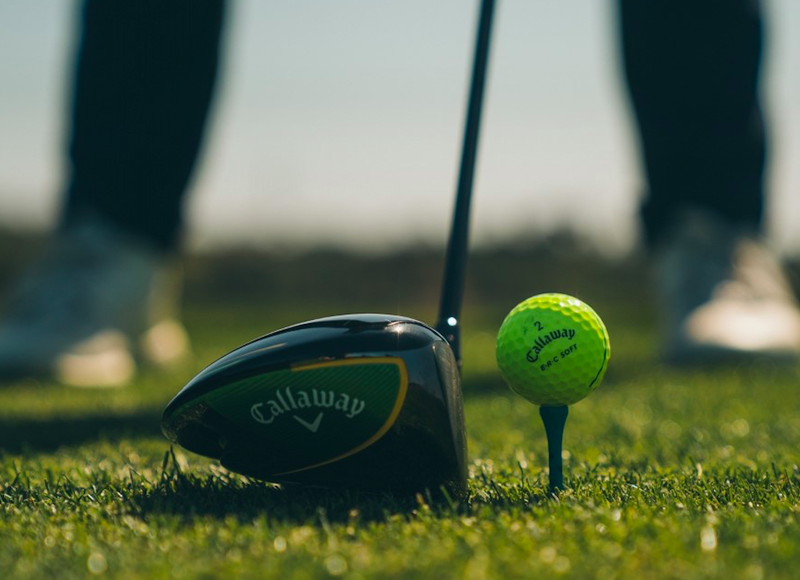 It has the unique capability to measure all critical ball and club parameters including: ball speed, club speed, launch angle, club face angle, ball spin and spin axis at high accuracy. 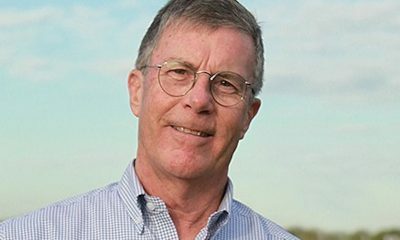 These factors have made High Definition Golf™ simulators the system of choice for PGA Tour pros such as Stephen Ames and top golf Instructors like Jim McLean. COST: High Definition Golf simulators run from $35,000 to $65,000 and 25 courses available. 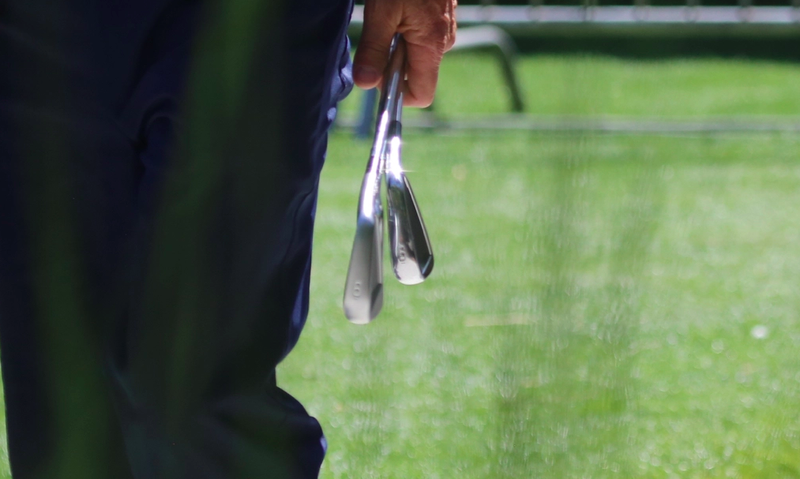 XGOLF out of Los Angeles, California was founded in 2000, and since then more than 3,000 systems have been sold worldwide, providing golf enthusiasts with a unique experience that emphasizes innovation coupled with honesty and integrity. Industry firsts such as the variable lie stance platform and the automatic ball teeing system have allowed XGOLF to pull away from the pack. These distinguishing features, along with 19 patents, present a very special value proposition to its customers. 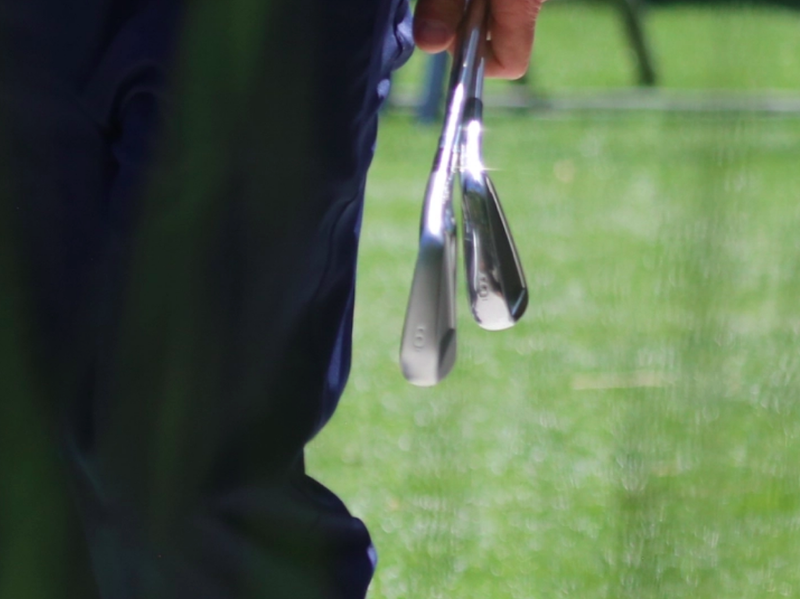 The hardware and software innovations such as dynamic weight balance, short-game playability (12″ putts for example), 3D Collision that provides real geometric reactions to when a ball makes contact with an object, are all examples of how XGOLF has listened and adapted to address the needs of the most discerning golfers from around the world. COST: X Golf simulators run from $35,000 to $65,000 and close to 100 courses available. The very latest in golf simulator technology, the GolfBlaster3D Golf System out of Tampa, Florida allows golfers to play on some of the most famous golf courses in the world and use their own standard golfing equipment. The GolfBlaster3D software has been created using the very latest graphics engines to allow the display of natural elements such as trees and bushes the highest level of realism. Not only are they portrayed in the highest level of detail but also they demonstrate tremendous realism when reacting with the wind. 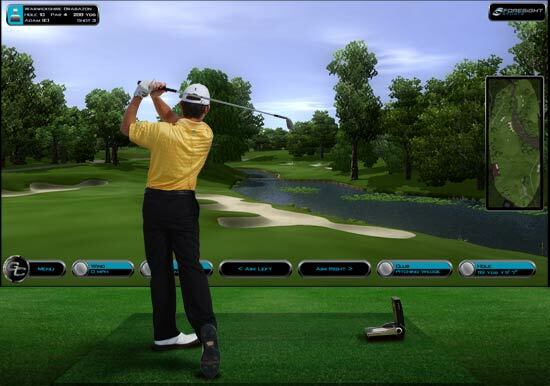 COST: GolfBlaster3D simulators run from $25,000 to $55,000 and 40 courses available. 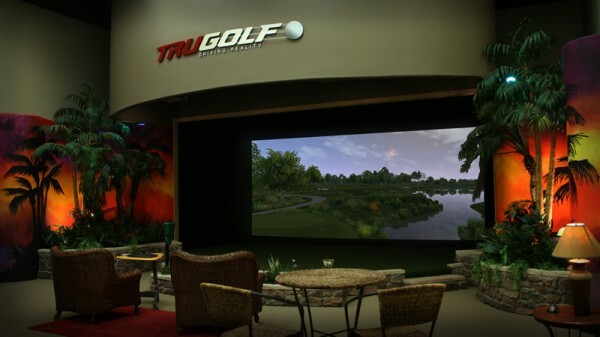 TruGolf out of Centerville, Utah offers affordable golf simulators. The Technique consists of three different models: Technique Personal, Technique Pro, and Technique Prestige. Each Technique consists of an easy to assemble aluminum frame with netting, their TruTrac Dual Tracking System with Integrated Swing Analyzer and are loaded with technology previously only available with very high-end systems. Perfect for the golfer desiring a year-round indoor golf experience with less cost, but designed with the teaching pro in mind. Portable, affordable, and feature rich, the Technique is unmatched in quality. TruGolf also can integrate TrackMan or FlightScope with their premium systems for home and business models. “Built for lasting performance in a commercial environment and flexible in design to appeal to any aesthetic; our system is fully customizable, allowing you to create an environment the entire family can embrace,” said Dave Ashby, executive vice president for TruGolf. COST: TruGolf simulators run from $7,995 to $55,000 and 83 courses available. Following on the revolutionary GC2 Smart Camera System, Foresight Sports out of San Diego, California introduces HMT – Head Measurement Technology – a ground-breaking innovation that combines with the GC2 to precisely capture club head data with an ease and accuracy never before seen. With HMT, a complete picture of your swing analysis and club head performance is now at your fingertips. Instantly see critical data such as club head velocity, horizontal club path, smash factor and dynamic loft and lie — even impact location — with the same unmatched accuracy you’re used to in the GC2. COST: Foresight Simulators run from $35,000 to $75,000 and 80 courses available. OptiShot out of Traverse City, Michigan is an affordable, accurate and portable home golf simulator. Sixteen advanced optical sensors accurately measure your club through the impact zone capturing shot impact conditions and instantaneously transmitting them through the USB cable to the software. COST: OptiShot models run from $399 to $4,000 and 21 course available. A new company to the portable simulator market has emerged. Accuracy — UNEX Anyshot Golf Video Software gives you precise measurements of your shot and difficulty levels can be adjusted for game purposes verses skill enhancement. Practice on different courses — a variety of course will give you the maximum skill-building benefits. 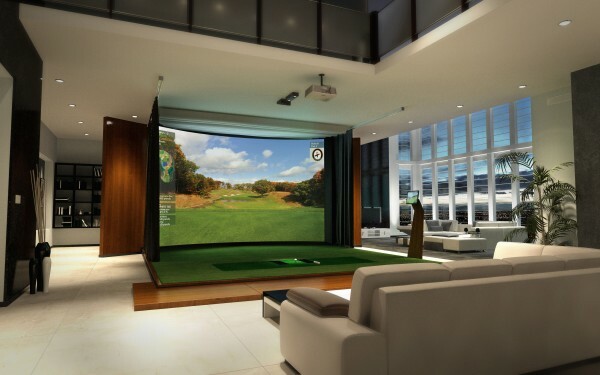 Our virtual software is so advanced that with panoramic projectors (not included), the UNEX software can project on three screens and put you inside the panoramic golf gaming experience. Enjoy the detailed, realistic graphics on your desktop monitor or laptop screen. It’s easy to adjust your settings using the UNEX Anyshot software for a totally customized golf game. 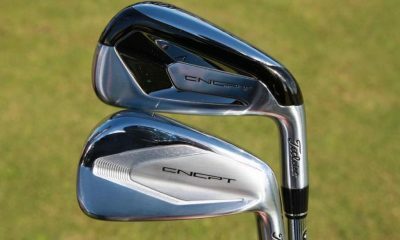 COST: Unex AnyShot goes for $399 and 14 courses are available. I am looking at a few systems for my house in Georgia… I understand that the good systems are quite pricey and I am OK with that, I will sacrifice money for quality for sure in this case. One thing that doesn’t ever seem to be discussed is ongoing support and the cost associated with it. I can’t seem to find anything about support costs on any of the websites… anyone have experience with any simulators? What are your annual costs and what system do you have? Is the support worth it? Golfzon are the worlds best, are you still in the market? What is not listed on this list is TrackMan Simulators. If you watch Golf Channel then you know that the ONLY technology used by the pro’s is TrackMan and it’s available for home use in a simulator. Also, when the weather is nice the same unit can be taken outdoors with your iPad. None of these other products can do that. Do your research but don’t be fooled. TrackMan is the leader for a reason. Try it and you’ll see. Yep Golfzon simulators are the best, have you ever played a simulator with a floor that moves to mimic your lie on a golf course, amazing! I have a query about the aboutGolf simulator unit. The price range is from $39K to $90K, does this includes the installation cost and shipping cost? Thank you. I sell my GOLFZON Simulator with right handed swing plate, about 60 courses, touch screen panel and 2 cameras, that shows your swing. When I bought the equipment, I have tested all other golf simulators available in 2007: Full Swing, Sports Coach, HD Golf, About Golf, ProTee and some others, I’ve forgotten. Golfzon was definitely the best. Fly over the course in 3D and enjoy the noises when the rain is falling (I’m using loudspeaker from the ceiling). It’s fantastic. My shots are very realistic (fade, draw, length). I’m not a talented golfer, but I lowered my handicap from 13 to 7. The simulator works perfectly. No damage, no malfunction, swing plate without any scratches. It is my private ? Anyone contemplating buying a golf simulator, stay away from PROTEE. The system is a trash. I bought one and when I tried setting it up with the help of their online support, I was told that lights are not bright enough to trigger the sensors and advice me to get brighter lights. Those lights came with sensors! I am so frustrated with these garbage. I wanted to return the system for a refund but, suppose it is a hopeless case. Don’t buy PROTEE. It’s a piece of garbage. I want to know if anyone is trying to bridge the gap between the new golf swing analyzers with some form of a simulator. They already give you the details of what your swing is doing and send it to you phone/tablet, how hard could it be to take the next step and use the information in a simulated game? I’m wondering if anyone has the sports coach simulator? If so have you had any problems with balls hitting the track camera system? Pictures make it look like it might come into play and could get damaged. Also how happy are you with the system overall. I’ve got a sports coach system. Absolutely fantastic, graphics lack a little compared to others but for swing and shot accuracy it will take some beating. I have a general question about golf simulators. Most of the companies say you can track your progress, but I can’t find any information on what parameters they track for the various strokes and how you retrieve the data. Is this because they do not actually provide the data storage for each player, they just provide the data for each session and it disappears once you end your session? Please send me info on your unit and how much your asking for it I live in Chicago. Hey guys there were several inquiries about my aboutGolf simulator unit. It is not the entire unit. It’s the processing unit that mounts to the top of the enclosure. It’s perfect for someone wanting to build one out, and save thousands. It’s their Studio unit that is basically a range with a launch monitor. It’s the same one you see on Breeds show. No golf courses. The course software is pricey, but will run on it. This unit is brand new in the box, still in the plastic. If anyone is interested, shoot me an email. I have a full swing golf simulator that I am looking to sell. I bought it for $50k new and upgraded the computer, software (e6) and projector last August($9K). I am asking $20K If anyone is interested, let me know and I will cover the transportation and installation costs. Could you send me some more details about what you have and the demensions needed for your unit.also we’re are u located. Thanks I’m near Chicago . I have an old DeadSolid system (size 15’x18’x10′). I am moving within Chicago suburbs and can’t fit it in my new house. Let me know if you are interested. Interested in the simulator but how can I contact you? I am interested in buying your set up , if it is still available. hi, i am interested in the symulator, what city are you in. Is your simulator still available? Send me the equipment details. I am building an area in my house for that purpose. I lived in Puerto Rico. 1- is it still available? 2- if you dont mind, why are you selling? 3- do you know a way I could confirm all works eg can I pay fullswing to come out and verify it? 4- do you know if full swing would install it, at my expense? I am interested if you still have it for sale? Let me know. Is this unit still for sale? Is your asking price negotiable? Can you send pictures of the actual unit? Do you have the original paperwork with dimensions and specifications? 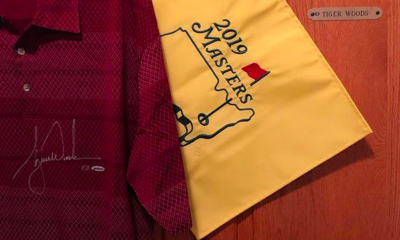 This article lists all the main manufacturers that were at the PGA Merchandise show in Orlando, FL. Not all the simulator companies spend the money to attend the show as it rarely results in direct sales. As a person that has been in the industry for 10 years, the technology has come a long ways. Most of the systems are pretty accurate at this point in time. Once accurate, it’s hard to improve. Choosing a simulator typically boils down to budget and what you are using it for – either for your home or an indoor golf center. Budget will obviously play an important part in any decision. However, software is key to the enjoyment of the simulator. For indoor golf centers, the golfers will want to play courses they have heard of and see on TV. 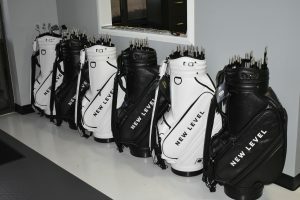 They will also want to play games such as skins, match play, alternate shot, scrambles, wolf, etc. 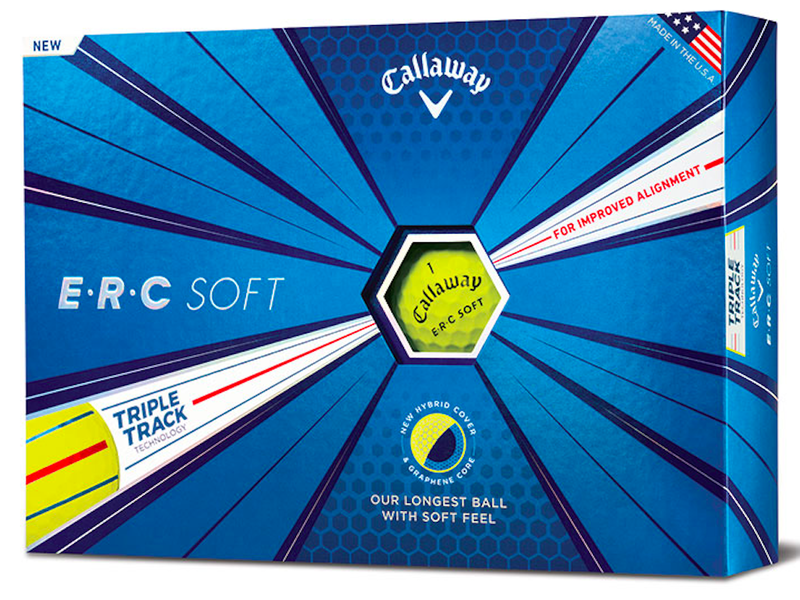 TruGolf’s e6 software was the widest selection of name brand courses and games. They are even coming out with online tournament play during the winter of 2014/2015. 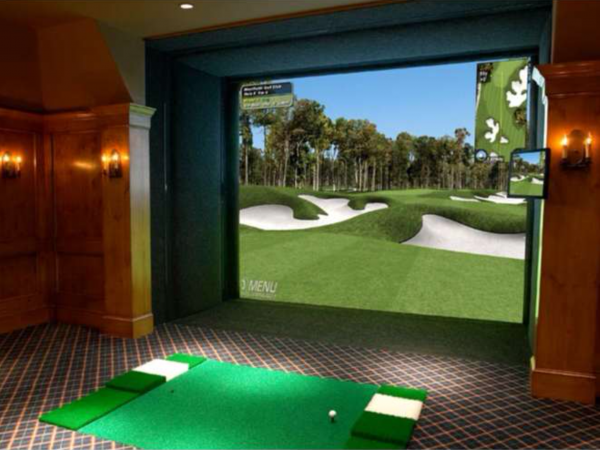 Ace Indoor Golf specializes in indoor golf simulators but also has residential simulators. We represent more than one simulator company and can fit it into your budget. It’s great to have the graphics don’t get me wrong, but if want something that will give you closest data to what you would have an outdoor strike, then there is no question to the About golf set up. I tried so many over 1yr period to check everything possible, I didn’t find anything as good as the About golf set up for such accurate data. If anyone is going to make an invest in to one of these then it should be the About Golf I took a yr to decide. I’ve got a brand new, in the box AboutGolf unit. Its never been turned on other than the QC checks, obviously. I don’t have room to set it up. You’ll need a mat, DLP projector, screen, and laptop. If you want to see one in action, go to a PGA Tour Superstore. AGL is the standard. I’m sure there are rules here about soliciting, if do my apologies. Maybe someone can direct me to a forum more suited for my purpose. interested buyer, e-mail me back if still have. I am about to buy one please reply if yours is still up for sale. Is this still available? Price? Simulator technology is NOT created equally. A quick look on eBay will tell you which systems you should NOT buy as eBay is where people sell junk. Also, image quality is not important IF you are really trying to improve your game. The only thing that matters is club data and ball flight accuracy. Unless you’re a + handicap you should bring your golf pro with you to try the simulator our and hit bad shots as well as good shots to see if the system can actually track your ball. 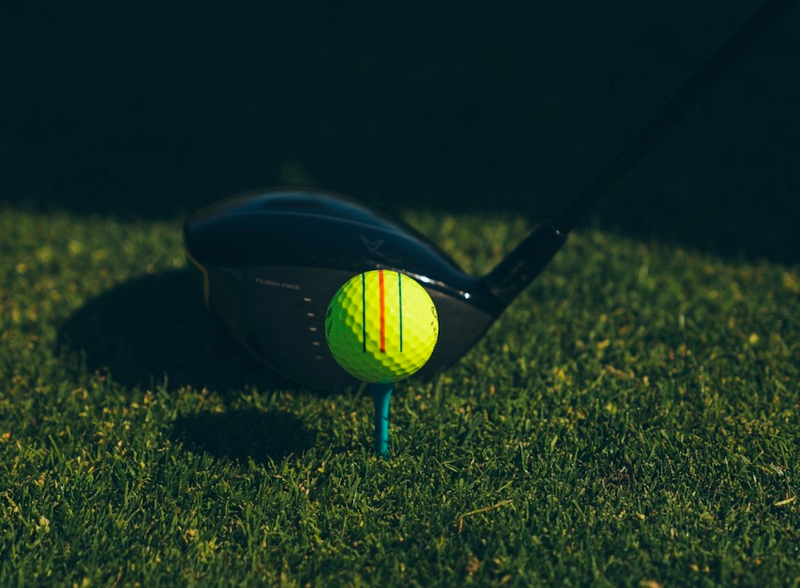 Many of the companies listed in this article are selling 25 year old technology with a fancy projector to make it look good, but ball flight data should be your priority. Unless you actually want a video game. 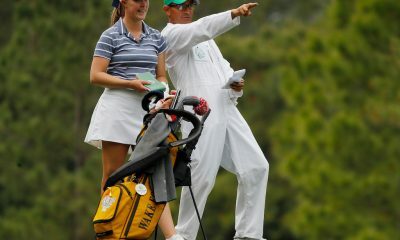 If you are serious, look at TrackMan. 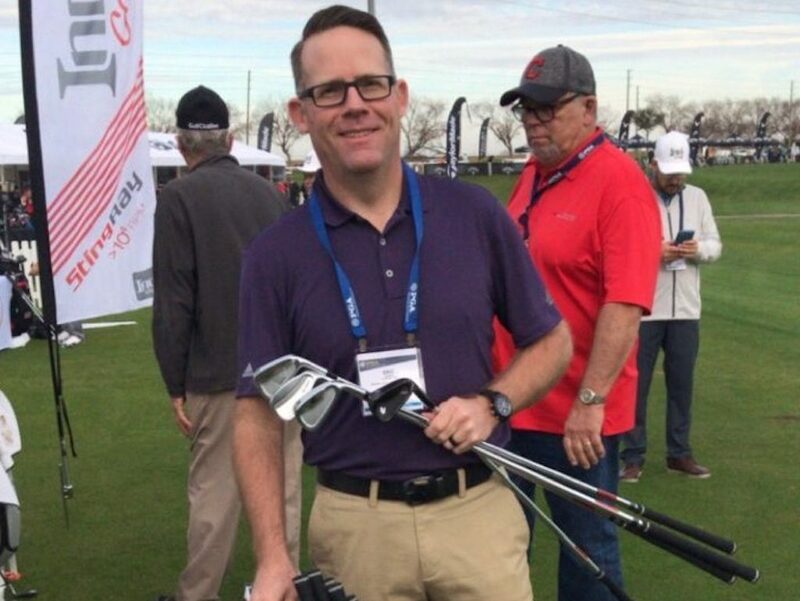 There is a reason why Sean Foley teaches with TrackMan and why 75% of the worlds Touring Pro’s own one personally. Don’t believe the hype, do your research and decide for yourself. Surprised too that DeadSolid Golf Simulators didn’t make the list for the article either. Thanks for the information of all the simulators. A short review of bogolf simulator would also be appreciated. Having purchased this year an About Golf simulator set up, there is nothing else that I have tried that can give me such an accurate reading of all the data. If I wanted to play the most delicate of lob shots, it will pick it up with ease compared to all of these other systems on here. I have had all of the systems on a trial basis and there is nothing quite like the About golf set up, I would really recommend this and I wouldn’t really think of anything else. My short game has improved tenfold by having this system as I can have absolute confidence in my game going from indoors to outdoors. About Golf has a team in London where I purchased mine from, they designed the whole area from start to finish and are helpful from day one to nearly a year I’ve had it highly recommended. Not to be too nosy but how much money (ballpark figure) are we talking for a set up like that? It really depends on what your looking for, I think they start at around £25k they will cater for all your needs. The guy that I dealt with is James Bowker on 02072488600 he will be able to give you a run down, they were very helpful from start to finish. The guy that I contacted and spoke to was James Bowker at About Golf uk, his contact number is 02072488600. Beautiful straight to the point iformation. I didn’t even know all these simulators existed. In my research for info I stumbled in a site which seems to provide some honest information. I would like some detailed info especially the kind and model number as i am in search for one myself, too. Thanks in advance. We have the pro 3 swing golf simulator for sale. We purchased and thought about doing it as a business and ended up not doing so. We have everything; greens, simulator, the software, projector, screen, nets, etc…it is only three months old…selling for $3000.00. We also have a box full of golf balls and golf decorations, we also have golf dividers. You may contact me at 304-483-5845 tks – if you’re not interested pass the word on. I also know how to setup the simulator. measurements etc. Do you still have this simulator available? Is this still available. May be interested. Please send let me know. What P3 units do you have? I set one of these up in my garage last year and played it all last winter (and will again this winter) Total cost was under $1000.00. If you want any details let me know. A couple of points: because space was limited it went into the garage. I have to pull the cars out and set it up which takes about 15 minutes. Break down’s about 15 minutes as well. Also, my garage is about 10′ (I think, I forget now). I’m 5’9″ and can hit any club. My brother’s 6’4″ and has put a couple of gouges in my garage ceiling using his driver. I would be keen to know the details of your setup as i have started the research but still been unable to make a decision. what system you have I have a 11 X 18 ft Garage with 10 ft ceiling . will the system you have work? I don’t suppose there is any way to measure that garage ceiling??? It would be a huge help to me because I am also 6’4″ and have about 9’10” worth of ceiling in my basement. 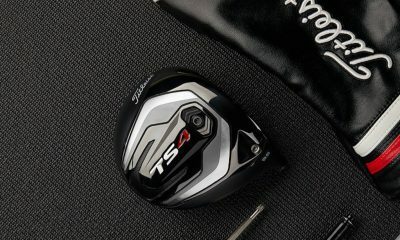 I want to install a simulator and I want to be able to swing my driver. Rob — Can you help me out??? Hi Rob, I would be interested in knowing more about your set up. The price is about in /my range andthe set up andpullndown time is alsonimportant. Hope your willingb to share the system you built and how you are fining the accuracy and any corrective feedbqack you get on you swing? I saw your post & wondered if you would mind sharing with me what system you have & where you purchased the system? I would like to get my husband one for christmas & all systems I have viewed where well above my price range. It sounds like you got a great deal! Can you tell me which simulator you purchased. Mine will be in my garage as well. Will I just need a laptop out there. Hi Rob! this is exactly what we want to do. ?set up a simulator in our garage. Can you tell me what simulator you purchased? We would like to stay around the same cost that you did. Are these simulators listed in best to worse or some other order? N’hésitez pas à contacter Reto Schaufelberger (Golfodrome.ch), il est distributeur de 3 modèles de simulateur de golf à prix abordable. Ces derniers sont également conçues pour être utilisé par des particuliers. Agree with Andy’s comment – we’ve purchased 15 units in total from Sports Coach Systems and are huge fans. We tested all the systems above before deciding on SCS. Best of luck. I have recently had the oppurtunity to play on a Golfzon simulator and found the graphics amazing. The simulator is on a swing plate that moves to give you a realistic lie on the course. Very innovative !! Great article! There are a few more systems worth looking at as well such as P3ProSwing, ProTee United, and Sports Coach. There is basically a system out there for every budget – each offering different levels of accuracy, analytics, features, options, courses, graphics, components, etc. Can you imagin having one of these babies in your basement? I would go down there in October and reappear in April! I wonder if you could ever make money as a business with one (or more) of these? Wow, great article. Our club just purchased an optics hot and we are going to hook it up to an HD projection screen. Introducing it to the members in mid February. I’m anxious to see how we’ll works. I think I can speak for everyone when I say that 1-7 are all pipe dreams for us. I will advise everyone to stay away from vectors,THEY ARE HORRIBLE!!!!! A bit late, but how did your installation go? Does the optishot work well with a HD projector? 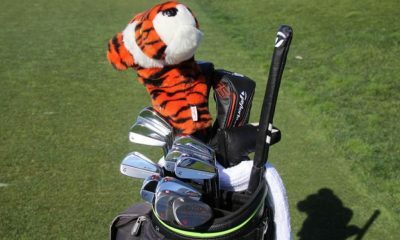 I think Kenny G has one in his house in Sherwood where tiger holds his challenge thing. These golf simulators look amazing. The ability to keep playing the game despite the outside weather is a great innovation. I only wish I had the room and the money to install one of these at my place. I don’t think I’d ever leave home if I got one! They were amazing and I think the technology will get much better in the next couple of years !! I agree I wish I could put one of these in my home too !!!! you forgot the best : GOLFZON !